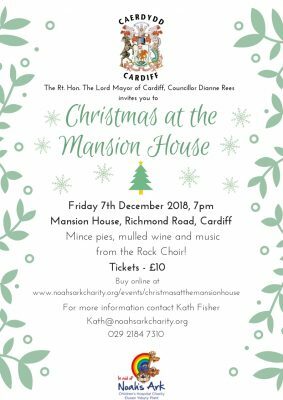 The Lord Mayor of Cardiff, Councillor Dianne Rees, invites you to welcome in the festive season with an evening of mince pies and mulled wine at the Mansion House. Entertainment will also be provided by the brilliant Rock Choir. All proceeds will go towards the Noah’s Ark Tiny Lives Appeal, which aims to raise £1 million to fund life-saving equipment and facilities for families as part of a project to develop and expand the neonatal unit at the University Hospital of Wales. Purchase your tickets below or for further information, contact Lucy Jones by calling 029 2184 7310 or email lucy@noahsarkcharity.org. Do you have a Media Enquiry?